The Armenian lobby of the U.S. is trying to get additional funds for Armenia and occupied Karabakh from Washington in speculative ways. In a relevant subcommittee on the appropriations of the U.S. House of Representatives, the co-chairman of the Board of Trustees of the Armenian Assembly of America (AAA), Van Krikorian, called for $100 million to be allocated to Armenia in 2020 to promote democracy and the economy. He also asked for at least $10 million for external strategic financing and international military education and at least $25 million for "assistance" to occupied Karabakh. Krikorian explained such considerable appetites with the April coup in Yerevan, the reception of Syrian Armenians by Armenia, who are presented to them as "Christians who are in danger in Syria and in the Middle East." But even more frivolous is the justification of the claim of $ 25 million for the self-proclaimed Nagorno-Karabakh. Krikorian believes that the separatist regime in the region is an "example of democracy," where the HALO Trust operates. 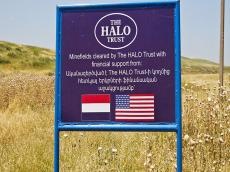 HALO Trust is a dubious structure that is currently illegally engaged in mine clearance in the occupied territories of Azerbaijan. The HALO Trust has been operating in the occupied territories since 2000 and is banned in Azerbaijan. It was blacklisted for illegal activities in occupied Karabakh. In 2011, Azerbaijan banned the transportation of HALO Trust equipment through the country’s territory to Afghanistan, after which it appealed to the UN with a complaint against Baku. However, the Azerbaijani side again demanded the cessation of unauthorized work. In the end, after negotiations through diplomatic channels, the equipment was sent to Georgia. Previously, the organization was funded by the United States, but then the Americans lost interest in its financing, and the HALO Trust found itself on self-reliance. Today, it actually acts on the money of the Armenian diaspora. Funding for the organization was unexpectedly discontinued in 2013. It was reported that international donors refused to finance the HALO Trust due to the inability to verify the accuracy of its reports. Remarkable that the Director for Legislative Issues of the Armenian National Committee of America (ANCA) Raffi Karakashyan addressed the same occasion (asking for funds) the day before. According to ANCA on Twitter, Karakashyan presented to the U.S. House of Representatives’ members a program of financial assistance to Armenia and occupied Karabakh, which includes economic assistance to Armenia in the amount of $30 million in trade, $10 million in military aid to Armenia, $20 million in support of Syrian refugees, $6 million in aid to Karabakh separatists, as well as $4 million for dispatching gunfire locators. So, the demands of Karakashyan are a bit more modest than those with which Krikorian spoke. The State Department repeatedly claimed that the U.S. does not recognize the independence of Nagorno-Karabakh and its leadership is not recognized by the United States. Thus, true U.S. support for the territorial integrity of Azerbaijan should entail a firm rejection of the Armenian occupation - in the form of cessation of funding for occupied Karabakh.